For the money, this is a very well-sorted guitar, intelligently conceived and very nicely made. Flamenco-influenced nylon- string electro with fast playability and authentic sound. The ultra-light build can cause feedback problems at higher volumes; fret tops are a little rough. While the steel-string acoustic seems very sorted in terms of its style and sound, the nylon- string continues to evolve, especially outside its flamenco and classical roots. One intriguing area is the 'crossover' guitar: a nylon-string designed to appeal to steel- string players. It isn't intended to appeal to scholarly classical players, but by narrowing the neck, adding a radius to the fingerboard and shaping a more steel-like neck profile, the concept has allowed many traditional nylon-string brands to appeal to a much broader audience. Córdoba may have only been founded in 1997, but it proudly states that it "seeks to guide the evolution of the nylon-string guitar, blending traditional craftsmanship of the early master luthiers with modern developments". "There's a linearity to the sound that's appealing, not hugely complex but nicely direct and clear." "Every guitar is lightweight, responsive and a direct descendant of the Spanish tradition," the company continues. 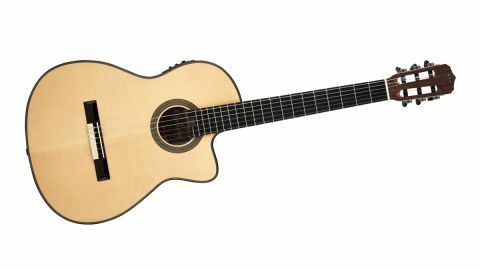 "Córdoba continues to challenge the definition of the acoustic guitar without sacrificing the authenticity of its heritage." It's a pretty bold claim, so is there some substance to it? Let's put them to the test. There's lots to choose from within Córdoba's current catalogue that, of course, includes more conventional classical guitars. Our review model falls into the crossover category. The Fusion 12 aims to make a steel-string player comfortable with its 48mm nut width, 16-inch radius'd 'board and quite steel- string-like C shaped neck profile. You can choose either a 14-fret or, as here, a more classical-style 12-fret neck join. It has a standard classical 650mm scale - close to Fender's 648mm - and is a cutaway electro powered by the almost ubiquitous Fishman Presys Blend system that mixes an under-saddle transducer with an internal mic and offers four-band EQ (if we include the notch filter), mic/pickup blend and tuner. "Typically for a Chinese build, we see very tidy 'board edges bound with matching ebony and rosewood to hide the fret tangs." In a Chinese factory context, Córdoba has made a very good stab at aping traditional Spanish construction. The Fusion 12 uses seven-fan braces, with a thin piece of bridge reinforcement and machine-kerfed linings, top and bottom. The internal soundhole rosette reinforcement is nicely carved and a traditionally shaped 'slipper heel' neck block (traditionally part of the neck, not a separate piece) that connects all the parts: neck, sides, top and back is used. The visible curved shape gives the necessary reinforcement to the top, under the fingerboard, while the extended foot spreads the load of the strings' tension onto the back. Typically for a Chinese build, we see very tidy 'board edges bound with matching ebony and rosewood to hide the fret tangs. Rosettes are inlaid wood, specifically concentric black/white wood rings, while body edges are rosewood-bound. Bone nuts and saddles are used. For this writer who is more used to a classical-width nylon-string electro, the Fusion does feel a little cramped in lower positions and the top strings are almost too close to the fingerboard edge, certainly compared with the Cordoba Iberia GK Studio and our reference (and well-gigged) Yamaha NCX. The Fusion, however, is a nicely balanced, a fine 'all round' guitar. There's a linearity to the sound that's appealing, not hugely complex but nicely direct and clear. However, the Fusion 12 does seem to have a slightly 'hot' G string output. It does, however, benefit from leaving its EQ controls flat and plugging into either a LR Baggs Venue DI or Fishman's Platinum Pro outboard EQ. Of course, for playing more dynamic flamenco styles, check you have enough headroom in your signal path if you're going to hit hard. Yes, as supplied, the fret tops were a little rough and needed a little work and that slight output unbalance would need to be checked. But that Spanish influence is very welcome both in feel and acoustic sound, although the light build could present problems in louder amplified settings. Still, for more moderate volume gigs, home, studio, practice and, well, just enjoyment, the Fusion has a lot going for it.